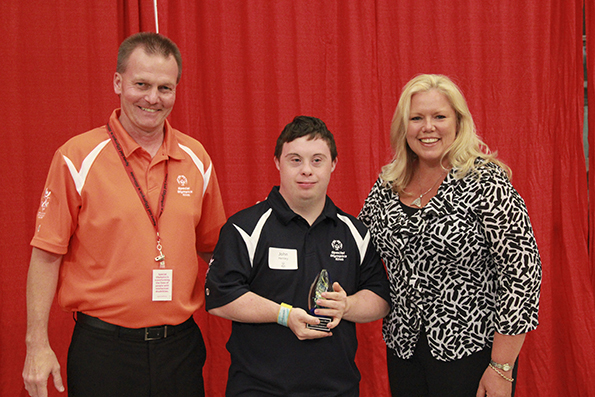 Christine Scheffler of Dixon has been named 2014 Special Olympics Illinois Outstanding Volunteer of the Year. She was honored at a reception June 13 before the Special Olympics Illinois Summer Games Opening Ceremonies at Illinois State University in Normal. Scheffler has been a Special Olympics volunteer for 21 years. She currently is employed as the Community Wellness Director at KSB Hospital in Dixon. She began her career as a coach for Kreider Service, where she coached for four years. Scheffler coached athletics, bowling, basketball and volunteered at the Special Olympics Dinner Dance. She has served on the committee for the Pumpkin Walk and has volunteered for Spring Games, Bowling Tournament and the Polar Plunge. She has also been a member of the Kick Off The Holidays Celebration committee for 18 years. Her committee members have raised more than $600,000 for SOILL Northwestern/Area 1. Not only is Scheffler committed to the athletes’ success, but her husband and two boys also volunteer. Plus, she has included her parents and guests willing to volunteer their time.